Here’s the bad news: there’s a lot wrong with the status quo in breast cancer. Cancer-linked chemicals in our daily lives. Racial inequities in mortality rates. Treatments that are too toxic and too expensive. Hypocritical corporate pinkwashing. But here’s the good news: our small but dedicated team at Breast Cancer Action is working hard to change the status quo. Every day, we’re working to achieve health justice for all women at risk of and living with breast cancer. And your support is essential. Please make your year-end donation today to support our bold work for women’s health. We refuse corporate funding from any company that profits from or contributes to breast cancer. I’ll be honest; it’s a harder way to raise money. It’s a whole lot easier to rely on big checks from corporate donors—but then we’d be beholden to them and remain silent on important issues. 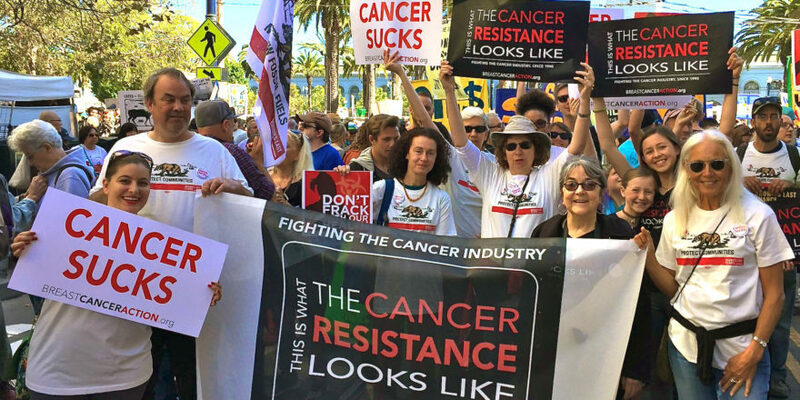 We rely on individuals like you, NOT corporate donors, to fund our grassroots activism. Please chip in $25, $50, or $100 today. We follow the evidence—not just hopeful hype—as we work on breast cancer screening and treatment from a patient perspective. We work to eliminate our involuntary exposures to toxic chemicals that increase our risk of breast cancer and affect cancer treatment. Our Think Before You Pink® campaign cuts through the pink noise and challenges pinkwashing hypocrisy and all the ways pink ribbon culture harms women’s health. The truth is, if Breast Cancer Action wasn’t doing this work, no one would be doing it. 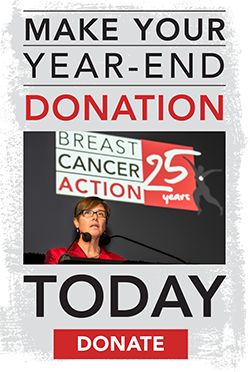 Make your year-end donation today to support our independent advocacy for women’s health.